By W. Gardner Selby on Thursday, July 7th, 2016 at 10:00 a.m. 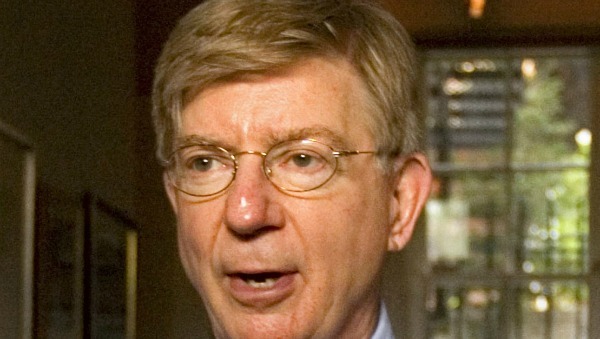 Commentator George Will, shown here in 2008, changed his 2016 voter registration from Republican to unaffiliated, PolitiFact Texas confirmed (Photo by The Associated Press). George Will changed his Maryland voter registration from Republican to unaffiliated the day after House Speaker Paul Ryan, R-Wis., endorsed Donald Trump for president. Longtime conservative commentator George Will has called presumptive Republican presidential nominee Donald Trump a "counterfeit Republican," warning even before Trump romped through the party's primaries: "If Trump is the Republican nominee in 2016, there might not be a conservative party in 2020 either." In a June 22 column, most recently, Will seemed to hope for Trump to experience "a defeat so humiliating — so continental — that even Republicans will be edified by it." Two days later, Will declared his personal punch line, saying in a speech covered by the PJ Media news site that he’d changed his Maryland voter registration from Republican to unaffiliated. Yes, we confirmed this week, and Will made his move just as he described it in June interviews. By email, Stacey Johnson of Maryland’s State Board of Elections responded to our query: "George Will's request from 6/3/2016 was processed 6/30/2016. He changed from Republican to Unaffiliated." Johnson said Will made the change online. Why poke into this from several states away? After Will declared his action, we didn’t spot any independent confirmation of it. Also, hailing from Texas, where voters don’t register by party, we saw this as a rare chance to peek into voter decisions in one of the 31 states where citizens may indicate a party lean when registering. In his June speech at a Federalist Society luncheon, according to PJ Media, Will said: "This is not my party." Will also acknowledged it's a "little too late" for the Republican Party to find a replacement for Trump but said he had a message for Republican voters. "Make sure he loses. Grit their teeth for four years and win the White House," Will said during an interview with PJ Media after his speech. He later told the Post that he’d changed his registration the day after House Speaker Paul Ryan of Wisconsin endorsed Trump--which Ryan did June 2. Far as we can tell, Will has not said he plans to vote for anyone else for president. Will, who lives in a suburb of Washington, D.C., wasn’t alone in making a party switch, according to a chart posted by the state board. In Will’s home county and statewide, in fact, more Democrats reconsidered. That is, Will was among 884 Montgomery County voters and 5,006 voters statewide to change Republican registrations to alternate choices including Democratic, Libertarian, Green, Unaffiliated and Other, the chart says. Some 987 county Democrats changed affiliations, per the chart, with 8,281 Democrats doing so statewide. Might this signal that Maryland Democrats are in a greater see-ya-later pickle than Republicans? Likely not; the state remains heavily Democratic. In June, per the chart, more than 2.1 million Maryland voters were registered Democrats. Some 1 million voters were signed up as Republicans.